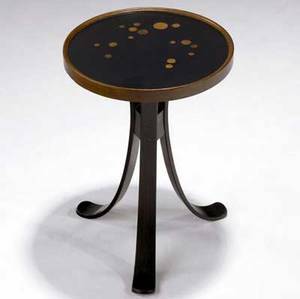 Edward wormley / dunbar constellation table with circular wood inlays to black lacquered top on laminated walnut base. dunbar brass "d" tag. 18 3/4" x 13" dia. 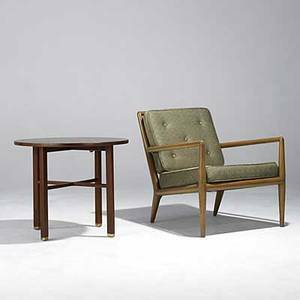 Archived auctions similar to Edward wormley / dunbar constellation table with circular wood inlays to black lacquered top on laminated walnut base. dunbar brass "d" tag. 18 3/4" x 13" dia. 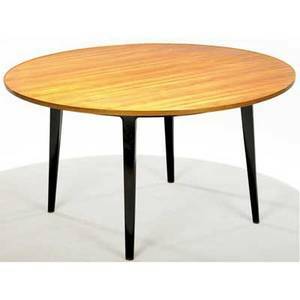 Edward wormley / dunbar dining table with bookmatched walnut top on dark stained base, with three 12" leaves. dunbar brass tag. 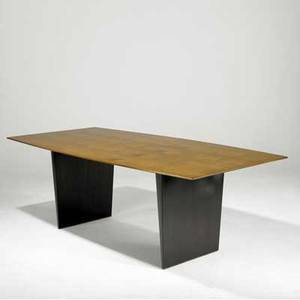 29" x 84" x 42"
Edward wormley / dunbar dining table in darkly stained wood with figured top, with two 18" leaves. brass dunbar d tag. 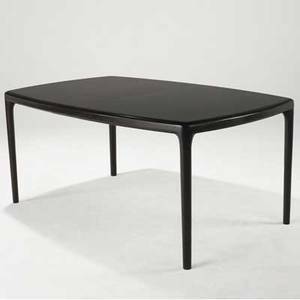 29" x 65" x 42"
Edward wormley / dunbar dining table with round figured tawi wood top on mahogany legs with brass-capped feet, with two 16" leaves. 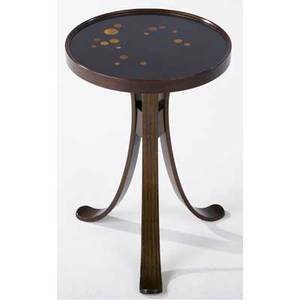 29" x 54"
Edward wormley / dunbar constellation occasional table with circular wood inlays to black lacquered top on molded walnut base. dunbar brass tag. 19" x 13" dia. 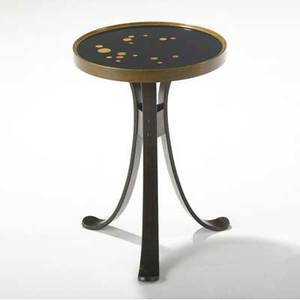 Edward wormley / dunbar constellation occasional table with circular wood inlays to black lacquered top on molded walnut base. dunbar brass tag. 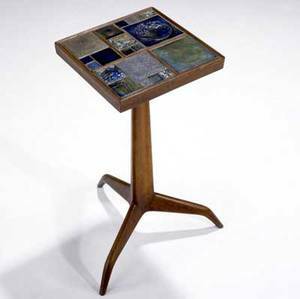 19" x 13"
Edward wormley / dunbar / tiffany walnut pedestal side table inset with tiffany favrile tiles, on tripod base. brass dunbar tag. 23" x 13 sq." 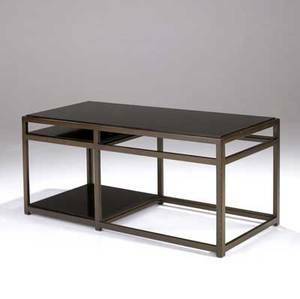 Edward wormley / dunbar sofa table with black laminate surfaces on oak frame. brass dunbar tag. 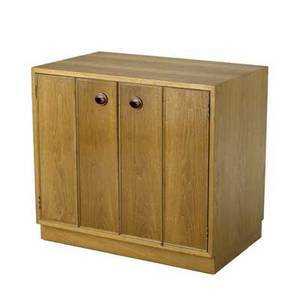 24" x 53 1/2" x 23"
Edward wormley / dunbar walnut cabinet with two bifold doors enclosing a single shelf. brass dunbar tag and paper factory tag. 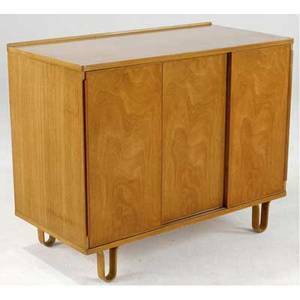 29 1/4" x 32" x 20"
Edward wormley / dunbar bleached mahogany server with sliding doors enclosing interior pull-out shelves on bentwood legs. dunbar paper tag. 34" x 42" x 21"